Marques (right) and Keeve Allicock in action during Sunday morning’s training sessions. whether Marques is capable of crossing this hurdle. For that reason, Marques has opened camp and has already commenced sparring sessions and is resolute that he will win the impending bout. Indeed, the last time Marques had entered the ‘square jungle,’ on February 2016, against Requena’s countryman, Freddy Beleno, seems a distant memory and the pundits are worried of ring rust. Quizzed to clear up doubts, Marques drew attention to the fact that when he fought Beleno he (Marques) had been inactive for almost two years after his bout against Jamaican, Rudolph Hedge; Marques showed little signs of ring rust then and went on to claim an easy majority decision. For the record, Marques fought Hedge in April 2014 and was away from the ring until February 2016 when he fought Beleno. It is clear that Marques has his eyes set on a victory when he opened camp at the Andrew ‘Sixhead’ Lewis Boxing Gym, Callendar Street, last Sunday morning. 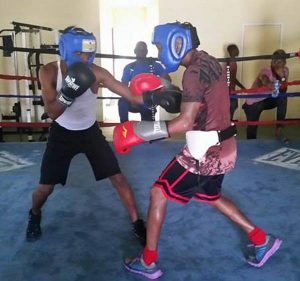 Under the shrewd tutelage of veteran coach, Lennox ‘Cappell’ Daniels, Marques unveiled his intentions with more than two hours of rigorous training that left those witnessing him, in awe. Marques has immediately commenced sparring sessions and boxed a total of 10 rounds with three amateur boxers, Isaiah Moore, Marlon Darrel and Keevin Allicock. It is early days yet and Marques will be engaging in many other sparring sessions but he looked sharp on Sunday and will only get better. His trainer, Daniels, seemed pleased but nevertheless cautioned that the journey has only now begun. “We are not certain of our opponent’s ability but we are leaving anything to chance,” said Daniels when quizzed on his charge’s approach to the bout. The veteran trainer is confident of his charge’s ability and is assured that he will whip himself into shape in time for his ring date. Marques also engaged in several stiff rounds on the heavy punching bag, serious abdominals exercises, skipping and a hectic session of calisthenics. He is confident of attaining top physical and mental condition for the bout. Marques fights the main bout of a card that includes several potentially action packed affairs including lightweight, Imran ‘Magic’ Khan against Keeve ‘Killer’ Allicock while Edmond DeClou tackles Winston Pompey in an 8 rounds super/middleweight clash. Three amateur bouts will complete the card including the bantamweight bout between women contenders, Rewinne David against Akeela Malazon, Jackford Joseph against Stephan Gouveia in a welterweight clash and Kelon Isaacs up against Euel Agustin.